The Spherification technique was introduced at el Bulli by Ferran Adria in 2003 marking an inflexion point in molecular gastronomy. 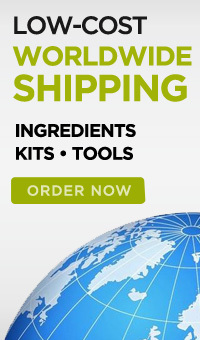 As many other molecular gastronomy techniques, spherification was discovered by working together with a leading company in the food industry and, of course, the genius of a chef like Ferran Adria and the rest of el Bulli team. In 2003, Ferran Adria and el Bulli team were visiting a company called Griffith España to see their installations when they came across a Mexican sauce that contained little balls in suspension which added acidity and spice when eaten. This reminded him of a drink he knew that contained little spheres made by immersing a liquid with sodium alginate in a bath of calcium. In both cases, the spheres were solid and did not have a liquid filling. They got a sample of the alginate and when they returned to el Bulli Taller, the experimentation began. Their first spherification experiment was with water as the main ingredient and a syringe to form little drops of the alginate solution. Because they used water in a water bath they couldn’t see any spheres but when they strained the liquid they discovered that they had been able to create small balls with liquid inside (now called caviar). Right after that they tried with a spoon instead of a syringe to create a larger sphere and now the first “spherical ravioli” was created. As we know today, spherification produces spherical forms of varying textures and consistencies and several of them were created in the first year. 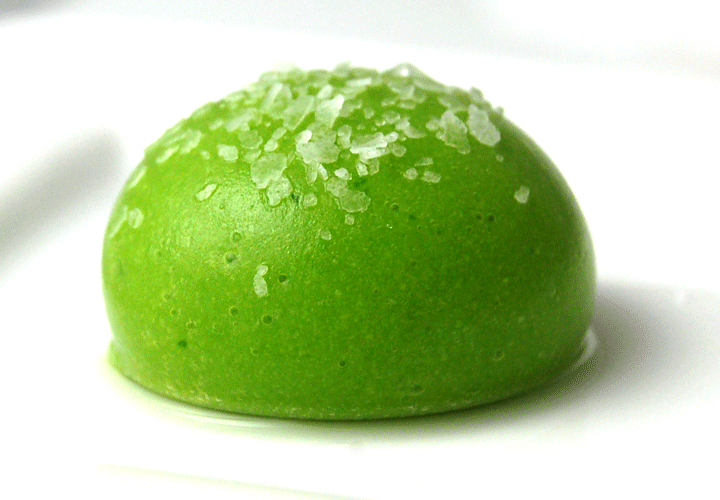 Spherical ravioli, filled ravioli, marbles and miniravioli: the first dish el Bulli team was able to prepare with spherification was the liquid pea ravioli. They came up with the name ravioli because they thought the sensation in the mouth was exactly like a ravioli filled with liquid. They then made mango ravioli, raspberry and filled ravioli with Gernika pepper broth and pepper seed filling. El Bulli team then tried a smaller version of the ravioli called miniravioli and the marbles. The latter is the same size as the ravioli but with a thicker membrane that maintains its perfect spherical form when plated and “explodes” in the mouth. 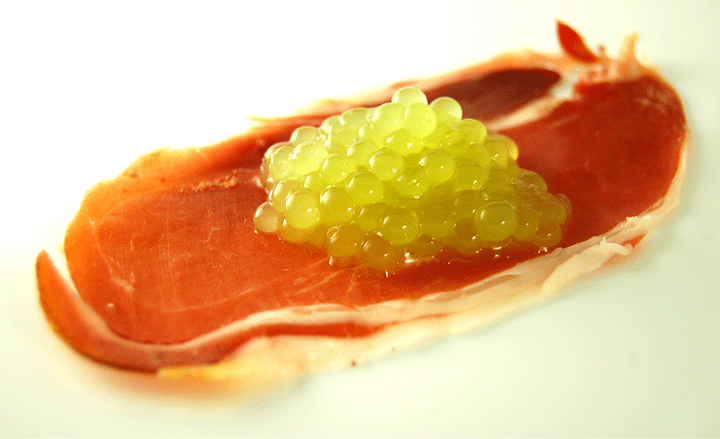 Spherical caviar and pellets: The team at el Bulli tried different ingredients for their first caviar dish and the winner was the Cantaloupe melon caviar. To be able to prepare enough caviar in a reasonable time to serve to dinners at el Bulli, they created a device with several syringes that could be pushed at the same time. Now you can use a more convenient device called the Caviar Maker. According to Adria, this was one of the most exciting times at el Bulli and Cantaloupe melon caviar was the signature dish of 2003. That year they also created truffle pellets using the spherification technique and macerating them in truffle juice overnight to intensify the flavor. Spherical balloons: After being served caviar and spherical ravioli, el Bulli’s customers were impressed one more time with another variation of the spherification technique. Spherical balloons are made using the spherification technique together with another technique developed at el Bulli using soda siphons. According to el Bulli, this preparation is one of the most difficult to make. The balloons were made by pouring rose-perfumed water and sodium alginate into the siphon. Then, using a special adaptor, el Bulli team activated the siphon over a calcium solution making opaque spheres. A minute later transparent balloons are formed. “Spherical” noodles: This was also the year of the first spherical noodles. The first noodles were created using a syringe filled with a mixture of lychee-juice and sodium alginate, then tracing zigzagged laces over the calcium solution, thus producing lychee noodles. 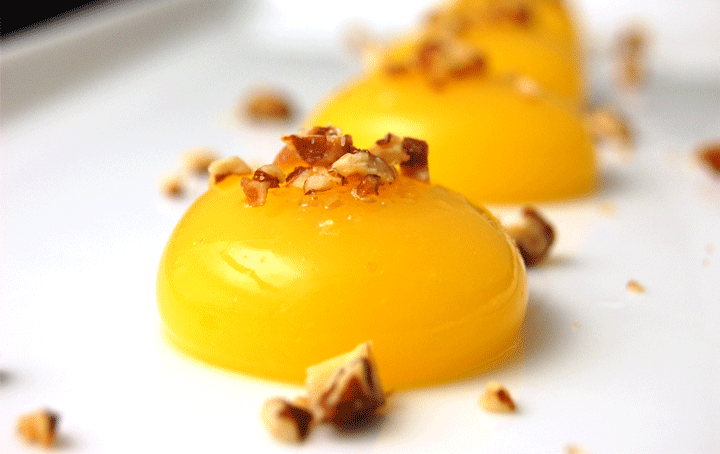 It is common to see in molecular gastronomy that when a new molecular technique is discovered, chefs keep using their imagination to apply it in different ways and come up with variations of the original technique to develop new concepts. This is exactly what happened at el Bulli with spherification in 2004. Four new ideas emerged. Spherical filled ravioli: In 2003 el Bulli made filled ravioli but this year with a frozen liquid inside instead of pepper seeds. This filled ravioli was made by placing a tablet of frozen lemon juice in the spoon containing tea with which they went on to form the tea sphere. 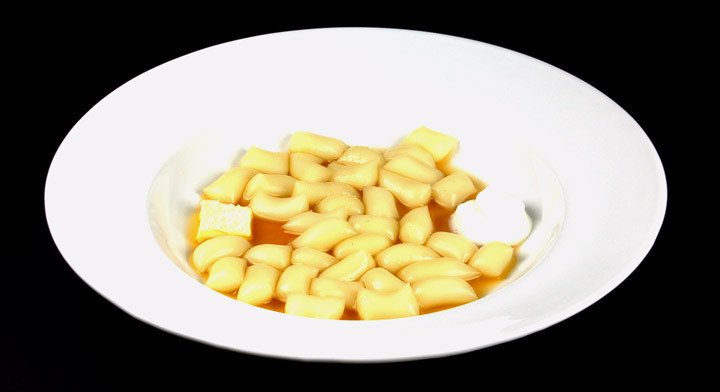 Spherical gnocchi: This is basically a sphere made from a foam, providing a unique creamy texture to the sphere filling. This year el Bulli had two versions of it. One was made of pumpkin purée and the other was an adaptation of the classic potato gnocchi. While el Bulli was serving the first spheres, el Bulli Taller, the scientific department of the restaurant, was researching how to modify the spherification technique to be able to work with products that already contained calcium in them. With Basic Spherification this natural calcium would trigger the jellification process of the liquid inside the sphere, obviously an unwanted effect. After multiple unsuccessful experiments to improve the spherification technique, el Bulli team realized that they could just try a reverse spherification by inverting the components and inserting a product that already contained calcium into an alginate bath. 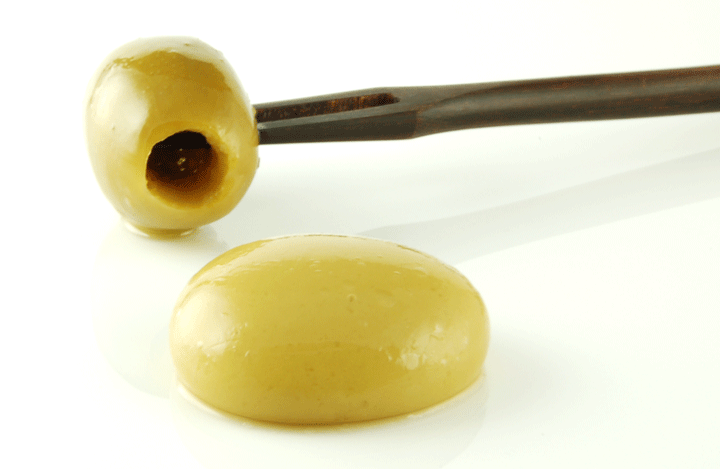 This discovery, now called Reversed Spherification, allowed el Bulli to create spheres with new ingredients like olives and dairy products for the first time ever. As an extra bonus (not minor), reverse spherification allowed el Bulli chef’s to detain the jellification of preparations, something they were unable to control in basic spherification.